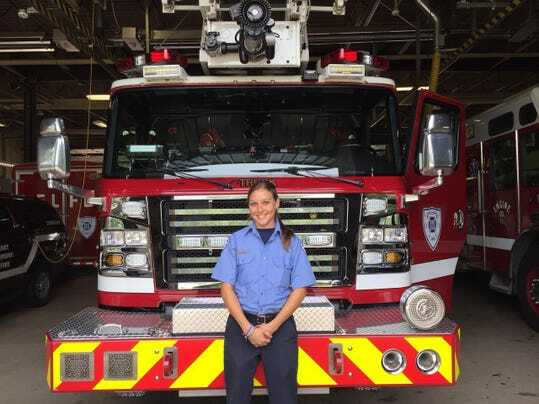 EAST LANSING — When Nicole Kitson started working as a firefighter in 2007, she learned that each day on the job had the potential to end in sacrifice. Later this month, she’ll run alongside fellow emergency responders to honor those who gave their lives on Sept. 11, 2001. Kitson is one of two Michigan runners selected by the Michigan Remembers 9-11 Fund to take part in the Tunnel to Tower 5K Run and Walk. The race will be held in New York City on Sept. 27. Working as an emergency responder wasn’t what Kitson originally envisioned for herself, she said. After graduating from Davenport University with a business degree, she worked for a year before realize she wasn’t content. “I wanted to be more involved in the community and do more than sit at a desk all day,” she said. Kitson took a job with the DeWitt Township Fire Department in 2007, where she completed her fire training and EMS certification. She now works as a firefighter and paramedic with the East Lansing Fire Department. She also works part-time as an instructor at Lansing Community College’s Regional Fire Training Center. It was during the 2014 Run to Remember in Lansing’s Old Town where she first heard about the New York event. Kitson decided to apply and was grateful to hear she’d been selected this year, she said. “It’s a great honor, I’m really excited to be chosen to represent our entire state,” she said. The Michigan Remembers 9-11 Fund is covering her race entry fee as well as the round trip flight, she said. Kitson and her fellow Michigan racer, Brian Behrend, an Oakland County Sheriff’s Department deputy, were selected because of their daily work serving the community, according to a press release from the fund. Kitson runs several 5K events throughout the year, both to raise money for worthy causes and for her general interest in fitness, she said. The New York Tunnel to Tower event is held annually in honor of Stephen Siller, a Brooklyn firefighter who lost his life in the aftermath of the 9/11 attack. Siller was traveling home after a late shift on Sept. 11, 2001, when the call about the first plane hitting the Twin Towers came over the radio. He headed back, only to find the Brooklyn Battery Tunnel closed. Strapping on 60 pounds of gear, he ran more than three miles to the World Trade Center. He gave his life that day providing assistance to victims of the attack, according to the Stephen Siller Tunnel to Towers Foundation’s website. The foundation hosts several races across the county in his honor as well as in appreciation for military service members. Kitson is also running in the Michigan fund’s Run to Remember, which kicks off at 8:45 a.m. Sept. 12 in Old Town. Registration for the event ends Friday at 6 p.m. More information, including how to sign-up, can be found on the Michigan Remembers 9-11 Fund website. To learn more about the Michigan Remembers 9-11 Fund or to register for this weekend’s race, visit their website at www.michiganremembers.dreamhosters.com.